That must have been tomato sauce or, more likely, ketchup — probably Heinz in our conventional household. We have no idea how the ghost’s corpse tasted. I wouldn’t blame Mom’s particular meatloaf for that. No matter how good the food she gave us every single night was, our kitchen-table meals tended toward forgettable. Dad was rarely home for them, which may have been both the cause and the effect of our sullen suppers. One of my fine Facebook friends in the deep Midwest likes to promote her circle’s meatloaf contests, which is why I decided never to post a photo of actual meatloaf ready on a plate. How many years of eating pleasure must you bank to imagine that something so mud-ugly could make anyone happy? But camera-ready or not, the end of 2011 is my meatloaf moment. The ever-twee village of Bellport, New York, on Long Island’s glistening South Shore, has a block-long commercial center of shops. Anchoring these is a small supermarket called Wallen’s. It had been the Roulston Grocery Store, which moved across main street in the ’30s to its present site, taking over the Comet Theater — where in 1917 Irving Berlin sang “Yip-Yip-Yaphank” (or “Yip! Yip! Yaphank!” according to a 1918 review in the New York Times, which must be right, no matter what the sheet music says). If you look hard, you can see remnants of the old vaudeville dressing rooms in Wallen’s storage area. 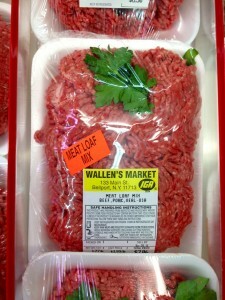 As long as I’ve been shopping there, Wallen’s has offered a freshly ground “meat loaf mix”: one-third each of beef, veal, pork, sometimes in three discrete lumps, lately blended together. Wallen’s cordial butchers have never failed me, and my gratitude rises especially high for their boned legs of lamb, having learned the hard way (from Beck, Bertholle and Child’s Mastering the Art of French Cooking) how wrist-aching and messy it is to bone the thing myself. Did the sweat of pride season my first, garlic-larded result? Sure it did; always does. 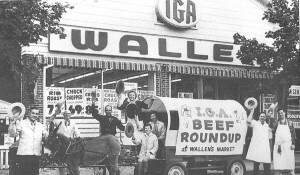 Decades later, just as I have fashioned a meatloaf worth writing about, Wallen’s announces it must close. Yes, some disasters are local. This December, as before, you pull open the door to a sepia, quasi-utopian zone. You slow down; your iPhone dissolves. Norman Rockwell fantasies are seductive and usually emotionally false, but when corn-flake nostalgia takes neighborly, shopping-bag form a few blocks away, it’s hard to resist taking part. The Jean Arthur-Jimmy Stewart you in this scenario could really be you. Why in heaven not? Wallen’s price for Hellman’s mayo is higher than that at the “local” Stop & Shop, but it almost equals out in the cost of gas that buys the corporate bargain. And after the farmstands close at Thanksgiving, Wallen’s still finds apples, broccoli, cabbage, cauliflower grown within pickup distance to put in its cool produce bins. After Wallen’s closes, will I have to grind it myself? My praise won’t save the store, not now or a year from now. Yet every writer knows that we treasure most what we know we’ll lose, so we pretend to try. With a cossetting smile, the butcher tells me that even though they’ll be gone, all will be well, thanking me for my concern. I’m relieved for him, but how could all be well or tolerable if I can’t get my meatloaf mix? I have spent years making fun of meatloaf, which technically is a way to stretch meat — a primitive Hamburger Helper. Those who claim that day-old-meatloaf sandwiches are better than the steaming aromatic preliminary have been easy to knock down, in a “so you love leftovers?” way. They are right, of course, but the hot stuff must be worth getting cold in the first place. The problem with meatloaf is its total surrender: each ingredient just gives up. Keeping the animal muscle moist with milky breadcrumbs and canned tomato isn’t enough; the parts should gain and strengthen through their baking, not wave the gray-meat flag the moment they spy an oven. Yet a meatloaf’s blending of identities, not ideal for creativity but the essence of democratic cooking, should result in a satisfying culinary negotiation. I have never cooked or eaten great meatloaf, because that’s not a possibility, but I’d like to offer one you could bed down with. 1 1/2 lbs. 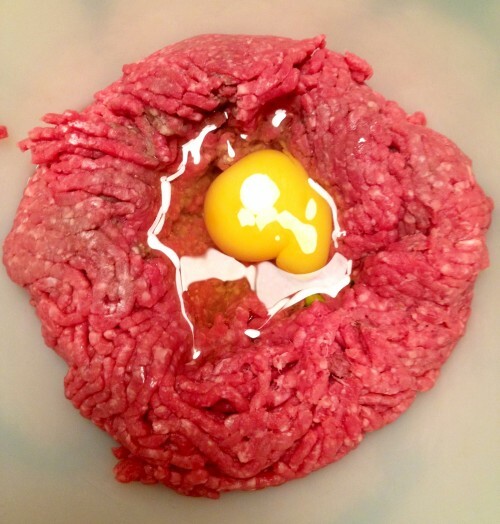 ground beef-pork-veal mix; or all ground chuck, under 80 percent lean best; or that fatty chuck and some ground pork too, up to half. optional: 1 or 2 crushed anchovies or a shake of Worcestershire sauce. Cider or wine vinegar. Some folks like nutmeg or allspice (I don’t). A better sub for milk: Mix half an envelope of gelatin into 1/4 to 1/2 cup beef broth or stock. Soak breadcrumbs in this after gelatin dissolves. The goal is to make two medium-size loaves you shape by hand, moist enough so they won’t dry out, but not so loose they sink and flatten in the pan before they hit the heat. Set oven at 350 degrees. Lightly oil an ovenproof pan — I use 8″ x 12″ Pyrex — or two pie plates. Place the chopped meat in the largest bowl you have, handling the sticky mass as if it were fluffy. Make a well in the middle and crack your egg in. If you squint, the yolk will look like a glazed orange garnet set in a brooch of deep carnelian. That shining jewel, I realize, is my only foregone meatloaf memory, one that waits for red-tipped fingers to break it. Loosely chop the vegetables, prunes, and possible anchovy into chunks, and either Cuisinart them quickly to retain some texture or continue to mince by hand. Oh, before you do that, soak the breadcrumbs in milk or the gelatined beef broth. A recipe for meatballs in the Sarcoptes or “Meat Mincer” chapter of ancient Rome’s Apicius cookbook adds red wine instead to its filler, which you may do too. One ripped slice of any bread in that same machine above takes a few seconds to crumb. Add the vegetable mixture and sodden crumbs to the bowl, with modest amounts of salt and whichever pepper. I season by eye. You don’t want to mask or strip the flavor that sits in the meat; you hope to provide accompaniment. We were given hands in order to stick them into Cthulhu treats such as the one in front of you, so pretend you’re mud-wrestling or caught in quicksand and squish everything around until a single, though particulate, tone is reached. Don’t squeeze and press the air out; play staccato piano in the bowl. Do not even think to answer the phone or door until you are done. Add more milk or a dash of vinegar if too dry; more dry crumbs if too wet. No need to rinse your hands. Grab half the stuff and place in half the pan, patting and poking it into a rounded, oblong loaf a few inches high, sides away from the edge so an almost-crust may form. Do the same in the other half. Manipulate the pair so they at least appear to be the same size (they never are), which also allows them to cook at about the same rate. Present the unattractive duo to your eating partner as if they were a king’s ransom, put ’em in the oven and bake for a little more than half an hour (depends upon how cold the meat is when you start) to an internal temperature of 155 degrees — that’s all. A siren fragrance will fill your kitchen, one that invites you to the food, but paradoxically always surpasses it. Remove the pan and test the loaves if you need to. Everyone else’s meatloaf is overdone: not ours. Tomorrow you may burn the remainder crisp and sign your snack with ketchup, enjoying it hot or cold, for breakfast or dinner, on bread or off, anyway you like. Meatloaf is meatloaf, and your own loaf life is now completely up to you. Happy New Year, Tobi! You have a better meatloaf memory than I do…Enjoy. Hope we can touch base soon. Cheers!